Pennsylvania Attorney General Josh Shapiro speaks to victims of clergy abuse outside the doors of the state Senate on Wednesday. HARRISBURG — A complicated game of calculus ensued Thursday after the Senate failed during its last voting session to reach any agreement on changes that would allow victims of child sexual abuse to file lawsuits for decades-old damage. Was there still a glimmer of hope, or was the "window" to temporarily loosen the civil statute of limitations to allow lawsuits closed? Nobody seemed certain. Everything screeched to a halt about 11 p.m. Wednesday as support seemed to teeter for a compromise measure championed by Senate President Pro Tempore Joe Scarnati (R., Jefferson). The plan would have given some clergy abuse victims two years in which to sue for decades-old abuse — but only to sue their abusers, not the institutions that may have ignored or covered up the crimes. That was unacceptable to the victims and their supporters in the Senate, so neither Scarnati's plan nor the House-passed bill temporarily opening up liability to institutions such as the Catholic Church went anywhere. 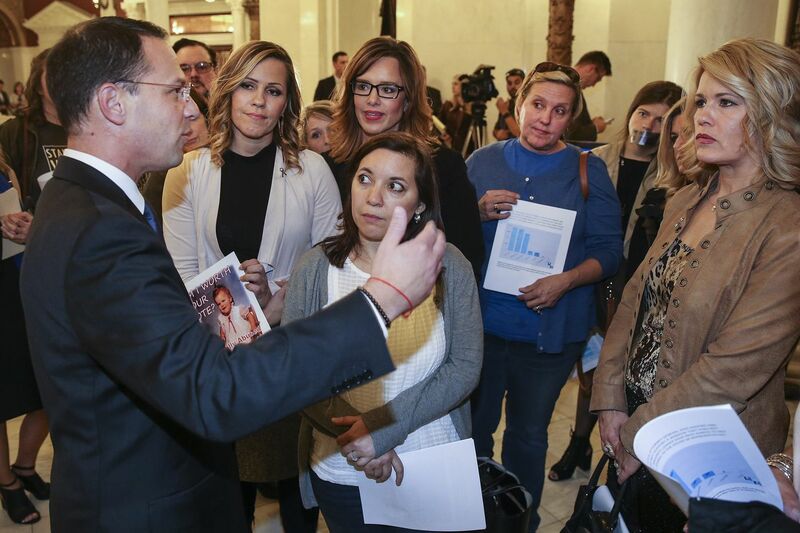 "If he added one word — institutions — last night, we would have been done," State Rep. Mark Rozzi (D., Berks), a clergy abuse survivor, said of the Scarnati proposal. "One word added to it, and … we would have sent it to the governor's desk." On Thursday, as news broke that federal authorities had subpoenaed every Roman Catholic diocese in the state, and as some senators' election opponents began hammering them, there were no obvious signs of progress. "We are in a stalemate and looking for some options and compromises from the other side," said Drew Crompton, chief of staff to Scarnati and the Senate's top attorney, referring to opponents of the proposal. Scarnati, following what was described as a rare defeat, could choose to call senators back for additional voting days, and his GOP counterparts in the House have put some pressure on him to do so. They left their members on call if needed to negotiate or vote. Some senators on Thursday said they were open to returning for a vote after Nov. 6, when they thought the political tide could change. One of them was Sen. Tommy Tomlinson (R., Bucks), who said he would be willing to vote for a measure that holds both the perpetrators and the institutions accountable. Scarnati could also choose to run out the clock, allowing the session to end without taking action. If that happens, the measure would have to start from scratch in the new year. Both the House and Senate will have new members — due to retirements, deaths or election defeats — and a fresh game of vote-counting will begin. Victims, their advocates, and Attorney General Josh Shapiro have vowed to keep pushing for the full implementation of all four recommendations suggested by the state grand jury that investigated widespread abuse in the Catholic Church over seven decades. Current law bars a victim of sexual abuse as a child from filing suit after age 30. The most contentious grand jury proposal was for a two-year window allowing older victims to sue. As the Senate wound down the final moments of its session Wednesday night, Shapiro, victims and a slew of legislators gathered on the marble steps inside the Capitol Rotunda. "Some of these victims behind me have waited decades for justice," said Shapiro, a Democrat. He called on senators to return, "do their job and pass these reforms." Then he turned to the victims and said, "I will never ever leave your side, and I will always be here with you." Democratic Sen. Vincent Hughes of Philadelphia described Wednesday night's setback as a "momentary blip." He called on voters to reach out to their senators and said that if a bill hasn't been passed by Election Day, "remember, remember who stood up for the victims. Remember who walked away from this." Some other Democrats were already taking the cue. On Thursday afternoon, Ezra Nanes, who is challenging Senate Majority Leader Jake Corman (R., Centre), accused Corman of walking away from victims and called him "guilty in his deafening silence." Corman's position on the bill has been hard to decipher. He did not answer reporters' questions about his stance on the Scarnati proposal. Rozzi said he met with Corman as negotiations were unfolding but left with no indications as to where the senator stood. "The public has the right to know where he stands on this issue," Rozzi said. Corman was not available Thursday. His spokesperson, Jennifer Kocher, said he was working to find a compromise on the bill. "There has been enough positioning on this bill, and it's time to focus on the victims," she said. Scarnati's positions were clearer. After the Senate left late Wednesday, he gathered reporters in his office as he defended his proposal and insisted that despite claims by others, it had enough votes to pass. "As the pro tem here, I've learned how to count, and I know how to count, and that's my job here," he said, his hoarse voice occasionally catching. He noted that his proposal adds in other recommendations of the grand jury — including penalties for failing to report child abuse and another declaring that nondisclosure agreements cannot prevent someone from speaking to law enforcement. It also includes another proposal lobbied for by the church — a victims' compensation fund. Scarnati noted that there have been dozens of victims inside the Capitol for weeks, but said he's heard from others in his home district. "There's hundreds of them, hundreds of them, that don't want to live this pain in a public forum," he said.